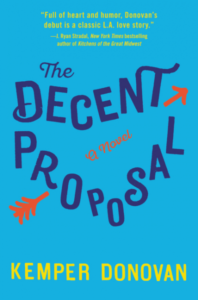 A humorous, heartfelt love story built on a tantalizing premise: would you agree to spend two hours a week with a stranger—just talking—to collect half a million dollars at the end of a year? I had a difficult time getting into this book, but it was a case of “it’s not you, it’s me,’ so I put it aside for a week or so, and then tried it again, and I found I really enjoyed it. The opening with Richard in his newly empty apartment, and his inner monologue about cancelling Netflix because even the $8.95/month seemed too expensive really reminded me of times in my own life , when Fuzzy and I were newly married and still learning to handle co-mingled finances. I think that kind of financial desperation is something everyone goes through in their twenties, and then we reach our thirties (and beyond) and (hopefully) put that behind us. It was that description that really made me fall into my second attempt at The Decent Proposal and ultimately I really enjoyed the experience. Kemper Donovan’s writing voice is easy and contemporary, which isn’t to imply that this book is overly ‘simple.’ It’s not. It’s a fabulous twist on the classic “mysterious benefactor as matchmaker” trope, with characters that feel like real people and dialogue that snaps and sizzles. As well, the entire novel is fabulously entertaining and engaging. Goes well with frou-frou coffee and a pastry at your cafe of choice. The Decent Proposal by Kemper Donovan by Melissa Bartell is licensed under a Creative Commons Attribution-NonCommercial-ShareAlike 4.0 International License. I’m so glad you gave this book a second chance … and that it turned out so well on the second try!